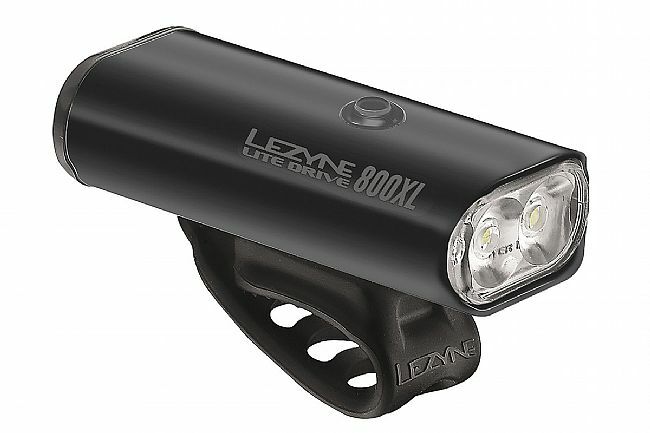 Lezyne's Lite Drive 800XL Special Edition Front Light is a high-performance multi-purpose LED cycling light featuring a compact, durable, and heat-dissipating machined aluminum body. The ultra high-output LEDs produce eight modes of illumination and emit up to 800 lumens. Mode Memory function ensures the light turns on in the mode in which it was powered off. The Enhanced MOR (Maximum Optical Reflection) lens delivers a bright beam of illumination while built-in side visibility enhances the rider's field of vision while also increasing their visibility to those around them. The Lezyne Lite Drive 800XL Special Edition Front Light features a limited finish, choose either Matte Black or Gold. Emits up to 800 lumens. High-speed 2 Amp USB charging capabilities. Great battery life, excellent visibility in the flash mode, and plenty of light for my local gravel trails. I haven't taken this on any single track or anything like that, but I imagine it would probably suffice for light (cautious) riding. Great Answer for Aero Handlebars. My wife bought a new bike that has the one-piece aero handlebarstem combination and the Garmin out-front dual mount for computer and headlight would not fit so the answer was to get a proprietary GPS mount and add the Lezyne 800XL for lighting purposes. The 800XL has several different modes (we use primarily the flashing mode for daytime safety) with varying degrees of brightness and seems to hold a charge to accommodate several rides before recharging. The rubber strap, although easy to remove from the handlebar for recharging the light, holds the light in position firmly while riding, even on chipseal or less than smooth pavement. The 800XL recharges quickly and vividly displays its state of charge via the color of the on-off button. An unusual feature is that when the 800XL is low on charge and on flashing mode, it converts to a lower powered steady mode in order for the rider to hopefully finish the ride with operational light. While the special edition 800XL comes in matte black or gold, the regular edition is available in several colors.